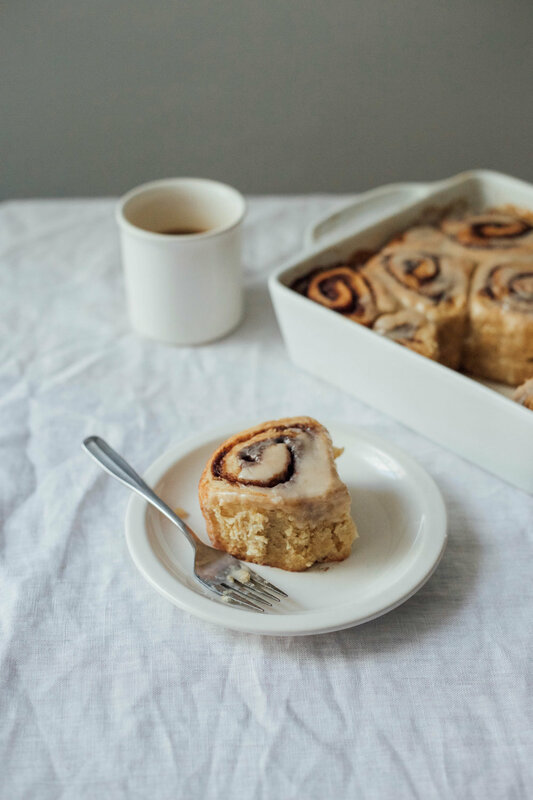 Over the weekend my brother came to visit, and I wanted to have a special breakfast item available so I made cinnamon buns from scratch. And they were AMAZING! I'm not trying to brag but everyone couldn't believe that I made something that tasted so good (maybe that says something about my baking skills and I should be offended). For the cinnamon buns, I modified Broma Bakery's Triple Glaze Buns and added some whole wheat flour to make them richer. It worked! I will be eating everything in bun form from now on. Aside from eating cinnamon buns, we made a homemade pizza, and spent a lot of time exploring Brooklyn. On Sunday night Pat and I also spent about six hours cleaning the apartment. My feet were killing me and I was complaining about how it was definitely too much work for a Sunday. But, being in a super clean, clutter-free apartment is such a nice feeling. As we were getting rid of stuff, I was slightly horrified that I even owned this much junk. Living in New York definitely makes you evaluate what you really need and I think I had gone a bit too long without considering this. We're going to be making some more updates to the apartment over the next couple of months, so I'll have to be extra considerate of what I bring home! In a large bowl, mix the sugar, yeast, salt, and flours together. In a smaller bowl, mix together butter, milk, and egg. Pour wet ingredients into dry and mix with a wooden spoon until combined. Using your hands, knead together the dough until it is smooth and combined. Transfer the dough to a floured surface and knead for a couple minutes until dough is elastic. Place dough in a well-oiled medium sized bowl. Cover with dish towel and let rise for 1-2 hours. To make the filling, combine brown sugar, cardamom, cinnamon, and nutmeg in another small bowl. Using a for, stir in 6 tablespoons of butter until incorporated. Set aside. Once dough has risen, preheat oven to 375°F. Roll dough out on a floured surface to an 12”x18” rectangle (approximately). Using a pastry brush, brush 2 tablespoons of melted butter over the dough. Then, spread cinnamon brown sugar filling evenly on top. Tightly wind the dough width-wise. Using a sharp knife, cut dough into round slices 1 1/4- 1 1/2 inches thick. Pack tightly into a 9x9 baking dish and bake for 25-30 minutes. While it's baking, mix together ingredients for glaze. 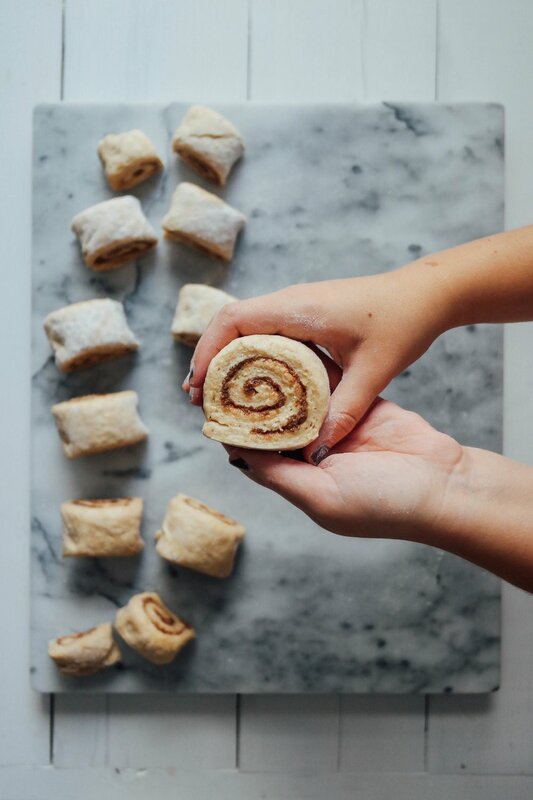 Once cinnamon buns are done, remove from oven and let cool for 10-15 minutes. 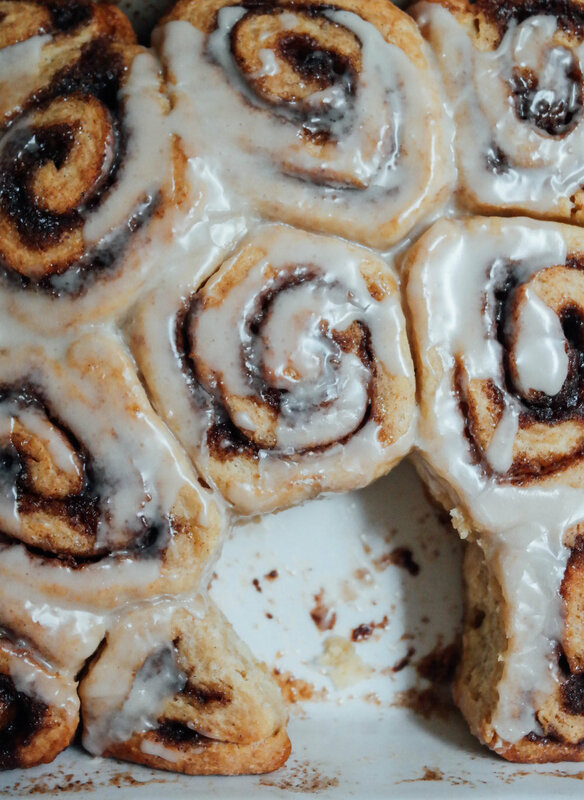 Pour glaze over the entire thing and enjoy.